Mexico has long been considered a low-tax country. The amount of tax revenue the government rakes in, as a percentage of the nation’s economy, has been small when compared to similar countries. 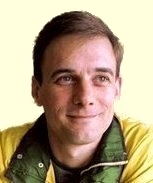 But what may seem like a feature to you and me seems like a bug to those in power, and to the international economic advisors and arm-twisters who see the Mexican economy as an insufficiently-wrung-out sponge. The government hiked the price of a fare in the Mexico City subway system by two-thirds. 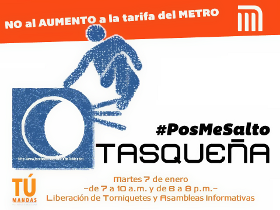 A movement called “Pos Me Salto” (“Well then, I’ll jump”) is encouraging people to become fare evaders in protest, and has organized turnstile-jumping protests in metro stations (here are some photos). The government also raised the value-added tax rate in regions bordering the U.S., which has made border-area businesses less competitive. The tax also applies to a new set of previously untaxed products, and is an additional economic strain on those living there. Some have taken to refusing to pay the tax at the checkout counter when purchasing such items. At NWTRCC’s blog, War Tax Talk , Erica Weiland has posted a thoughtful piece on the various ways tax resisters choose to interact with the IRS. There’s a new web site Tax Rebellion that is trying to push the case that citizens of countries like the U.K. or U.S. that habitually engage in war crimes and aggressive warfare have a legal obligation to withdraw their support (particularly their taxes) from their governments. By the playbook of the great “privatization” swindle that has been so popular among governments in recent years, when the government of France designed its new tax on freight trucks, it contracted with an Italian company to implement the program. But then the bonnets rouges came along and burned down all the truck-scanning portals and forced the government to suspend the tax. The Italian company that won the contract, Ecomouv, was however smart enough to anticipate such an outcome in their contract, and they’re guaranteed an €18 million payment from the government every month whether they’re collecting any tax or not. Taxi drivers in Tunisia are posting signs in the windows of their cabs that read “I will not pay tax!” and are daring the police to try to enforce new taxes on motorists against them. Meanwhile, some Greek motorists have adopted the strategy of paying only a single euro of their road tax, while submitting a protest, as a way of baffling the bureaucracy. An article I wrote has been picked up by the Popular Resistance site. It explains how my method of tax resistance has helped me lead a more abundant life and one I can be more proud of.